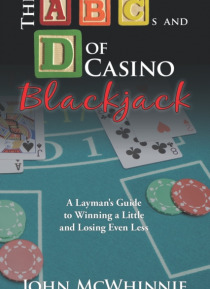 This book is for the beginner or recreational Blackjack player who wants to enjoy playing without being intimidated. If one has the discipline to follow the strategies presented, one can actually come out a winner. The title, The A, B, Cs and D of Casino Blackjack identifies it as a primer for beginners rather than promising riches to professional gamblers. This book provides a conservative… approach, and will help you avoid the simple mistakes that cause players to lose in the long run. It is amazing how many players do not bring enough bankroll, bet consistently, understand Basic Strategy or practice good money management. This light and punchy guide can be read in one sitting and understood and applied by anyone with an interest in the game. It should appeal to the one time tourist or occasional visitor to a casino or cruise ship who wants to try their hand at Blackjack. Also, someone wanting to take up Blackjack as a recreational sport on a regular basis would be interested in this book. In fact, even seasoned players may well benefit from getting back to basics. The book uses simple language to explain the probability theory behind Basic Strategy and the potential advantage of counting cards. It also explains how things work on the casino floor as well as table etiquette so players wont make embarrassing mistakes. The major premise is to take the intimidation out of sitting down to play. This book does not promise riches but does promote having fun without losing any of your hard earned money.